The much awaited Reliance Jio service is all set for its commercial launch. The services are already open for its Lyf smartphones, Jio partners and employees. Now, Reliance is trying to partner with other smartphone companies to allow their users to access Jio services prior to the official launch. A deal with Samsung has already gone through. Let us take a look at the requirements, procedure and benefits of this scheme. Basically, you will need a Samsung phone to get this SIM card, but remember not all Samsung phones are supported under this scheme. Samsung A series, S series and Note series phones (except Note 3) are included in this scheme. First of all you will have to download MyJio App (Android) on your Samsung Phone. Check whether Jio Preview Offer is available in your location. If it is available, then you will have to generate your exclusive Jio Preview Offer coupon code. 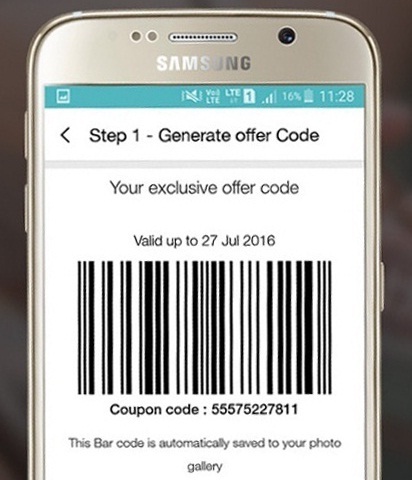 Take a screenshot of the Offer coupon code screen. Choose the Proof of Identity and Proof of Address documents that you are going to submit To the Reliance Store, select any one from the options available. Find the nearest Reliance Digital and Dx Mini Store from where you can collect your SIM. Take a printout of the screenshot of the coupon code screen taken earlier. Also, compile the photocopies of the Proof of Identity and Proof of Address documents that you have selected earlier and also a passport size photograph. Head on to the nearest store with the printout, photocopies, photograph and original documents. Submit the printout, photograph and photocopies to the nearest store and collect your Jio SIM. Activate your Jio SIM by dialing 1977, to avail the benefits. You will receive a message on your mobile number and your email ID informing you about the activation. 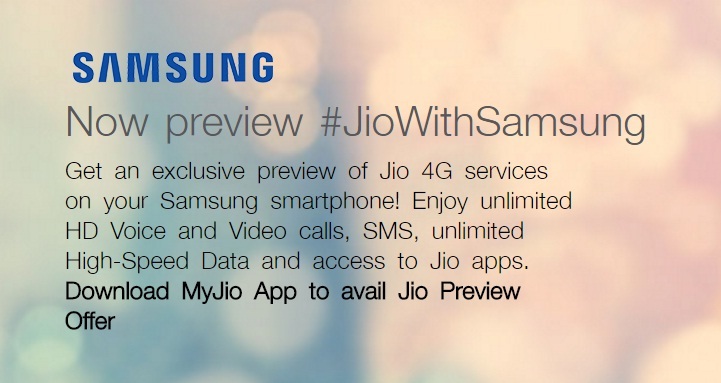 Once the Jio Preview Offer is activated on your Samsung device, you will enjoy unlimited HD Voice & Video calling, unlimited SMS, unlimited Data and access to Jio apps like JioPlay, JioOnDemand, JioBeats, JioMags, JioXpressNews, JioDrive JioSecurity and JioMoney for a period of 3 months.